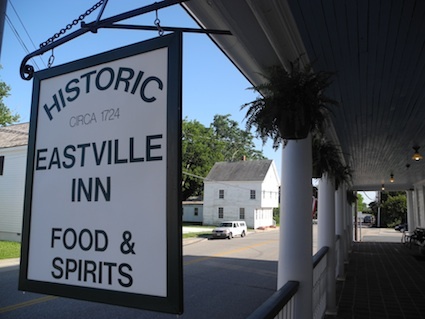 As an Eastville native, I have seen the Eastville Inn change hands several times. And long-time Eastville resident Ralph Dodd says he’s seen the Inn run by “six or more” people during the time he’s been around. Different tastes and visions have passed through the Eastville Inn as quickly as flipping through the pages of a book. And now the Eastville Inn has another new owner: Brent Schmidt, who until recently was owner-chef of Brent’s Fine Foods in downtown Hampton. Schmidt is returning the Eastville Inn’s menu to offer upscale dining, after the last proprietor’s unsuccessful attempt to attract a larger clientele with diner-style food. “It looks sharp inside,” Dodd adds. Dodd sees the inn as a valuable asset to the Town of Eastville, especially considering its historical background. The Inn dates to 1724. Despite some changes over the years, the building still holds its antique charm and has attracted both locals and passersby with its promise of a great bite to eat. Brent, Becky, Bill, and the rest of the Eastville Inn staff have certainly infused the building with their own flair, combining delicious seafood dishes with more traditional, yet artfully prepared, local foods. After viewing the menu, Cape Charles resident Cheryl Celli commented on the “great variety” offered and her family’s excitement over the crawfish dishes. 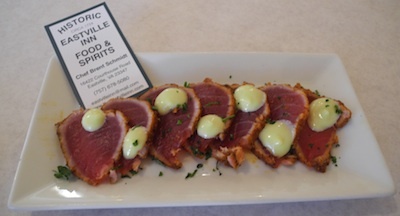 At the Eastville Inn’s grand opening last week I carefully studied the new menu before deciding on appetizers of brie fondue in a house-made bread bowl and tuna sashimi — at the recommendation of the friendly wait staff. When the artistically arranged dishes arrived at my table I had a hard time believing I was still in Eastville. My main course of pasta and colorful, delicious vegetables in a delectable almond pesto had me looking out the window at the Eastville Post Office to make sure I was still on the Eastern Shore! Schmidt said he has been very pleased by similar responses from locals like me. “The Three Course Dinner for $30 has been very popular among the dinner crowd,” he added. 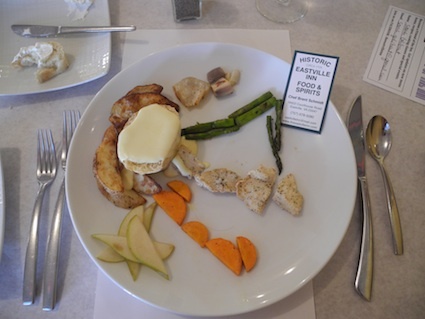 Course options vary based on the best, freshest food Schmidt has in the kitchen, and this Eastville native has no doubt that the Eastville Inn will prove a pleasure to locals and visitors alike this summer season. I had the pleasure of dining at Brent’s in Hampton, VA. Let me say that it was an absolute delight — the food was outstanding along with the atmosphere and service. We are proud of you Brent and hope that you are at the Inn for many years to come. I have been coming to Cape Charles for vacation since 2005 and have loved watching the town developments, however I am sad to see that there are a lot of shops and attractions do not even open till Thursday. I would think that with the summer months being the busiest time of the year the town would want people to enjoy everything and have a reason to visit Monday – Wednesday. Ray and I were joined with good friends Andy and Maggie. Food was wonderful and service great. Chocolate Bread Pudding is a must to have. Just had Brunch there today with my Boys….very nice meals and polite service! Best of Luck to you! I grew up in Eastville. My grandmother, Ellen Baker, ran the Eastville Inn back in 1968. And the rooms were available to rent then.